Be it an individual or a whole community, the definition of who and what we are, comes from an experience or set of experiences, that for all of time, will clarify for that individual or group, a self awareness that marks their perception of all things. Through those experiences they will view and understand all future events in their lives. 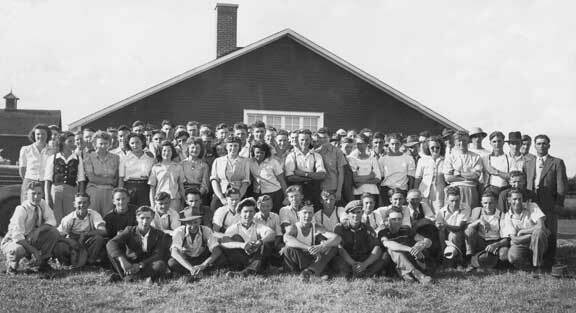 This is a group of young people who met at Indian Head in the summer of 1946 they are members of the 4-H calf clubs of the southeastern portion of Saskatchewan. You will be able to look through the picture and see their leaders while the members themselves had to be nineteen years or younger. From Indian Head to Moosomin and the surrounding communities these individuals were the children and grandchildren of the first wave of farmers who came to Saskatchewan in the 1880s. The second wave of Saskatchewan farmers settle along the Canadian National mainline from Melville to Biggar and included Saskatchewan's Ukrainian and Russian settlers. The third wave of Saskatchewan farmers were mostly Americans, people from Europe, a significant large number of German people who had come to the United States then headed North to settle in Western Saskatchewan. 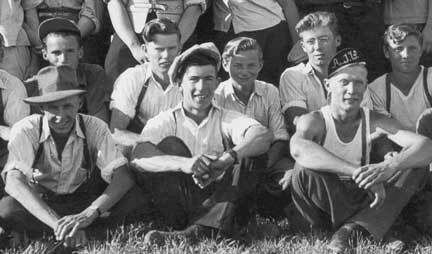 But the first group of Saskatchewan farmers were mostly English, with some Scots among them and in this picture we are looking at a group of English young people. The next thing that struck me as I fixed cracks and specks was how good everyone looked. Not a single person in the bunch appears to be overweight. The men look like they just stepped out of an adventure movie and the young women all have the charm of a forties black and white movie with romantic music and apple pies cooling on the window sill. Saskatchewan had a lot of people (about two million) after the "Great War" for it was then in the twenties that vast sections of the province were opened up and settled. Places like Tisdale, Paddockwood, Hafford, Sturgis became centres as the farms were cut into the wilderness. But for the people in this picture they were being born each in the twenties on quarter section farms with chickens, a few hogs, a milk cow or two and sixty acres of wheat. But then came the crushing stock market crash of 1929, their families who depended on selling some grain to pay for the things they needed, were in trouble, but they were not like the people on the open grasslands around and South of Regina who depended entirely on grain production. With mixed farms and even a poor garden, with the farm animals, they could put food on their table. For them, growing up in the thirties was hard, but not impossible, just very hard. The drought of the thirties came in thirty -two and just got worse. In the years were a crop did grow the hail seemed to smash those hopes and the dirty years dragged on with the lowest amount of rainfall in 1937. In the group photo above crouched behind the fellow on the extreme right in the front row is Ed Clark. Ed served overseas in World War II so for him, it was not something he heard about on the radio. He and his brother were outstanding cattle breeders East of Kipling at Inchkeith and no doubt he was at this event as a lead,r as he was to old to be an active member. But each of these people in this picture knew people like Ed Clark, brothers, uncles, cousins, some who had already come home and some who would never return. For these people are the parents of the baby boomers. The depression was not behind them and nor was world war two. For in their minds those two dramatic events of history were just yesterday and certainly could happen tomorrow. One might think that they would have realised that the worst was over and it was time to live and be happy but that is definitely not the case. For them, their whole life time had been in time of dire conditions, the drought, the depression and the war, everything they saw and all that they looked at were through the eyes of the dirty-thirties and the war. A set of scrap iron cars in a train would cause these people to shudder, for scrap iron was seen as war material, something gathered up to make weapons. For indeed, that is what happened during the war. Every old model "T" no longer in use did not have a radiator, as those had been removed and taken away to make bullets. In this picture the tall man is wearing a military style hat but he was to young to be in the conflict. 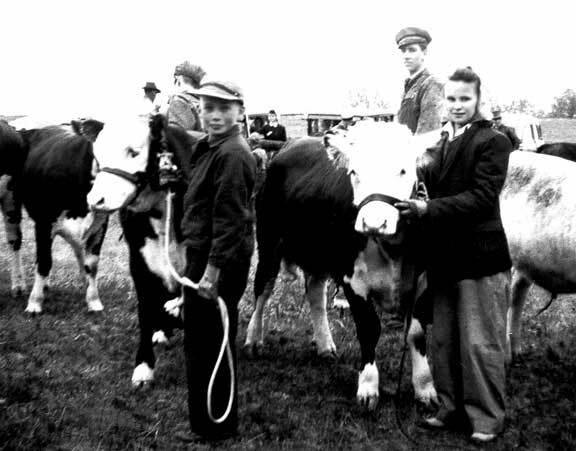 This picture was taken at a 4-H calf show in either Raga or Fairmead districts near Moosomin. Movies and movie theatres were in every little town and these people went to those movies and what did they see? Before the cartoon that preceded the feature, they saw "MovieTone News" horrific film footage of the war, even though it was over, the screens were lit with pictures of "D Day", nuclear explosions and generals reviewing troops. Europe was still occupied and thousands of Canadian soldiers were still in Germany, flying to and from it, wrestling trucks around the devastation of Europe and many were still at sea. Canadians would trickle home from war until 1948 when the Russians began to raise tensions around Berlin and the radio came alive with the tensions that would become known as the cold war while in the East, though the Japanese had surrendered, China was once again bursting into full civil war. The movie features themselves were about the war, as Hollywood cranked out the movies about the conflict, or with the conflict in its background, since for America, the war was almost three years shorter than it had been in Canada. If you look at the dates on the great war movies about the era, most of the good ones were made in the 1950s. But all was not grim and sadness for these people who had learned to live in difficult times had found a way to deal with difficult times. They loved music and every school house was a dance hall. Three of the hit songs from 1946 were You'd be so nice to come home to, Doin' what come natur'lly and Zip-a-dee-doo-dah. For my generation these were the people who would teach us how to live with adversity, as they dutifully passed on what they knew. Their children heard the stories and sensed the importance of the depression, the dirty thirties and the chronic fear of world war. Some political scientists believe that the shape of our political present is directly a result of this era and these people and their peers. 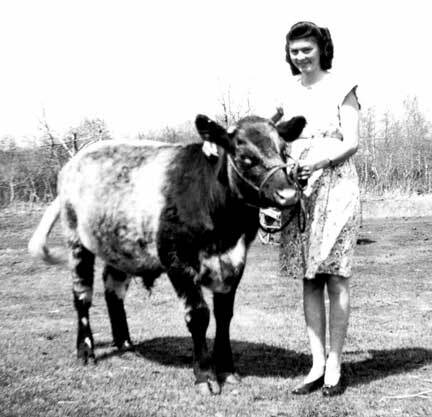 Of one thing we can be certain, the cattle that came to market in the fifties brought excellent prices because of the remarkable improvement brought about in herds by the 4-H movement. 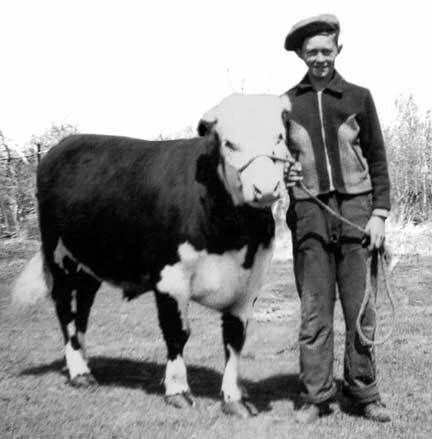 Pure bred Hereford, Short Horn and Angus herds replaced the skinny scrubs of the twenties and thirties so that by the mid fifties the majority of southeastern Saskatchewan farmers were purebred producers. It is interesting that by the end of the seventies this concentration of blood lines produced undersized animals and it was necessary to introduce European breeds such as Charolais, Limosin, Maine Anjou and Semmental. But this story is far more that about cattle breeding and I am certain that when they were meeting that summer in day in Indian Head fifty-six years ago they knew that they were living in a world that was going to change very quickly. They had seen and experienced what they knew then was the the introduction to some rapid technical and social changes. They were perhaps better able to cope than almost any generation before them and as we know they launched into their futures and our world is what they produced. They were political aware and would see the to it that medical care would be universal to everyone in their province, they would get electricity into their homes and appreciate the better world that they had been deprived of as children and they would make sure that their children would not have to go through what they had and they would say so over and over. One of the things that marked this crowd as they realised their own shortcomings and no group of people would move their children toward education like they did. Few of them benefited from university but their children assumed that it was something they all had to do. The people in that picture at the top of the page are all now in their seventies. Their lives were hard., their childhood did not involve music lessons, hockey practice and rock concerts, as my mom would say, "they made do" they were and are a happy troop just like the music they listened to in the summer of 1946.